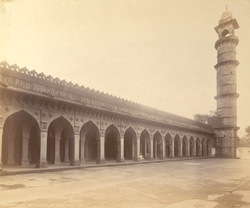 Photograph of the Jami Masjid at Burhanpur in Madhya Pradesh, taken by Henry Cousens in c. 1892-94. Burhanpur stands on the north bank of the Tapti River and was founded by Nasir Khan in about 1400. This image of the mosque, which was built in 1588 by Ali Khan, shows the screen of arches on the east façade. Alexander Cunningham wrote in his report for the Archaeological Survey of India for the years 1873-1875 (Vol IX), "The building is in very good condition...The roof is vaulted throughout , with pendents at all the points of intersection of the vaults. There is no lofty central arch, and no great colour to attract the eye; but the long line of battlement pierced by fifteen pointed arches and flanked by two lofty minars, 120 feet in height, has certainly a very pleasing as well as a very striking effect. The front view recalls the Moti Masjid at Agra, and the pleasing effect of both is no doubt due to the same cause, the harmonious symmetry of their proportions."